For writer Jeff Kirshman, Kanye West’s 2007 track “Homecoming” will always remind him of the year he moved to Wyoming and the jukebox at a place called Wonder Bar, which became an important part of his social life. That’s the kind of strong personal association with a piece of music that Brooklyn magazine is spotlighting through an ambitious project called “The Musical Map Of The United States.” Each state of the union is represented by a specific song, though some states (including Illinois and California) get two songs apiece and Ohio somehow merits three. 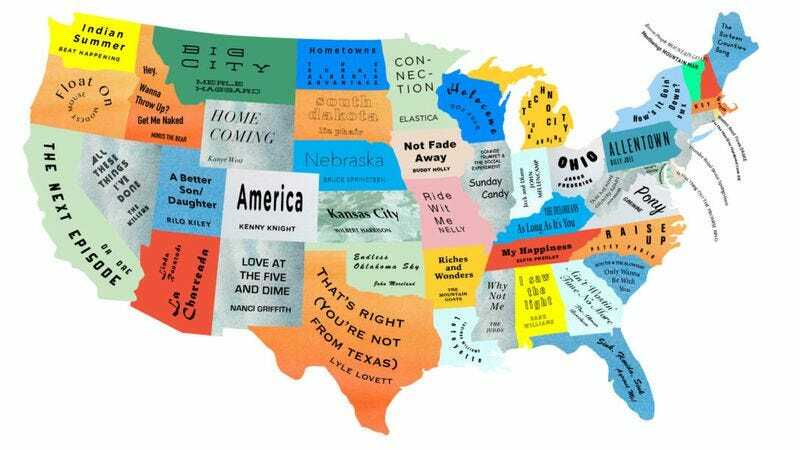 It would be possible to map the most popular or famous song from each state, but that’s not really what this project is about. At the heart of it, this is a collection of personal essays in which various writers explain why they associate particular songs with particular states. As the project’s introduction points out: “Sometimes, the pairings are on the nose.” It does not take a great leap of faith, for instance, to connect Lyle Lovett with the state of Texas or Bruce Springsteen with New Jersey or Nebraska (he sings of both here). But some of the pairings are wilder. Sara Fulton, for example, associates the state of Alaska with “Whoomp! (There It Is)” by Tag Team, a 1990s hip hop duo from Atlanta. Why? For Fulton, this song provided the soundtrack to hours of summer fun during her childhood. “I loved it so much I got the tape and would play it in my Walkman literally every chance I got and unfortunately overplayed it to the point of no return,” she confesses. In her essay about “Not Fade Away,” meanwhile, Hilary Saunders explains how Buddy Holly’s legend looms large in Iowa, the state where he died in a 1959 plane crash. Brooklyn’s musical map is not clickable or interactive, but a list of all the songs and essays can be found here.